Been some time since I written something on unit trust, but since everyone seems to hate upon them, then perhaps I would write about them. This one might be applicable if you own some unit trust, or you owned some investment linked policies under your insurer. One of my friend was relating to me that he has recently bought some unit trust. Not too long ago in July. And was shocked that in less than 3 months, a 1% loss turned into a nearly 10% loss. He also asked if he should be removing the wrap fees around his unit trusts considering his agent does not do the switching for him. So that is like 2 questions altogether. Usually, for a unit trust, there is a benchmark, or an index that the manager of the unit trust would try to beat. Usually, the benchmark is the index for that country, or that asset class. In this case majority of his unit trust is for China and India, so a good proxy for comparison here is the MSCI China Index and MSCI India Index. 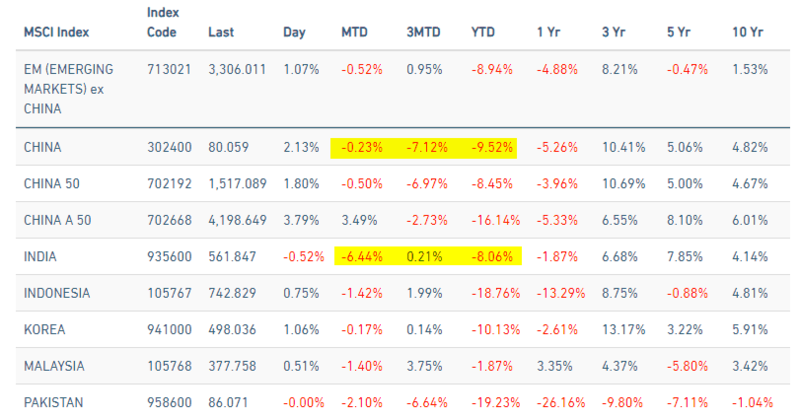 While we do not have the actual period, we can see that for China had a 7.12% fall for the period and India a 0.21% gain. However, month to date, India have a larger carnage. Given all this the year to day returns for both is -8% to -9.5%. I think you should assess your unit trust performance. And firstly, the ideal candidates to assess is of course against the index but also across the peers. You will realize that the month to date, and 3 month returns are pretty similar to the index. Well not totally but the 3 month returns range from -5.15% to -17.25%. Compare this to -7.12%. Some unit trust outperformed the index by losing less during the period. While some more. On a 1 month basis, the returns range from -2.4% to 2.99%. Compare this to -0.23%. A lot of them outperformed during this period. My friend’s China unit trust -10% returns is not uncommon when placed against the peers. 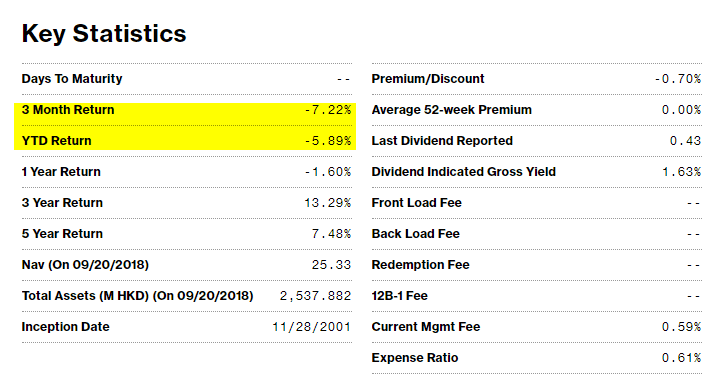 There are no 1 month return, but there is a 3 month return of -7.22%. That is pretty close to the MSCI China index return. Just a 0.10% difference. The ETF or exchange traded fund is a valid lower cost alternative to the unit trust. And as you can see, it mirrors the performance of the index. The expense ratio is 0.61%. In comparison, the average expense ratio of the unit trust in the comparison above is 1.68% to 2.03%. The 3 month return of the India Unit Trust look all worse off than the Index. The 1 month return varies from -3.48% to -7.76%. Compare this versus -6.44% for the index. Some unit trust did better, some did worse. I think India generally looks better 3 month wise versus China, so my friend may have a higher weightage to China over there. 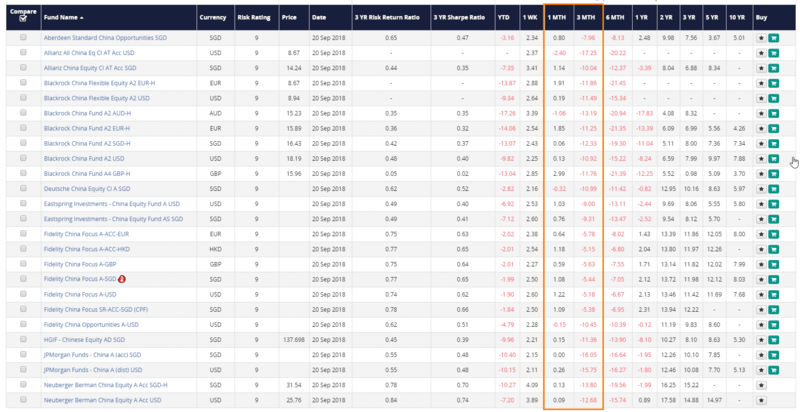 The ETF’s 3 month return of -1.76% underperformed that of the index return of 0.21%. At different time frames, ETF returns might be close or not close to the index. It is not a given that if you buy an ETF, your returns will exactly match the index. Does the China and India Unit Trusts Outperform the China and India Index Over a 10 years Period? I think unit trust by nature, are longer term instruments. Thus, we should evaluate their performance over a longer term. Suppose we compare the 10 year return of the stable of China Unit Trust and India Unit Trust against the index. In the previous section, the tables illustrate the 10 year returns. These returns includes the dividend reinvested, but probably before sales charges. They do include the expenses. On average, those China unit trust that survives to 10 years average 3.7%/yr to 8.03%/yr. $100,000 invested 10 years ago becomes $143,809 to $216,492 depending on which China ETF you invest in. The index? it did 4.82%/yr. All but 2 unit trust beat the index. On average, those India unit trust that survives to 10 years average 2.68%/yr to 13.50%/yr. $100,000 invested 10 years ago becomes $130,274 to $354,779 depending on which China ETF you invest in. The index? it did 4.14%/yr. 4 Indian Unit Trust was not able to Beat the Index. 7 was able to. This seem to lend to the justification that there are change of outperformance for active managers. But man, that India unit trust doing 13.5%/yr over 10 years…. god mode. I am not sure whether the situation is similar from years ago, but I do tend to think that a lot of these strategies stayed the same. 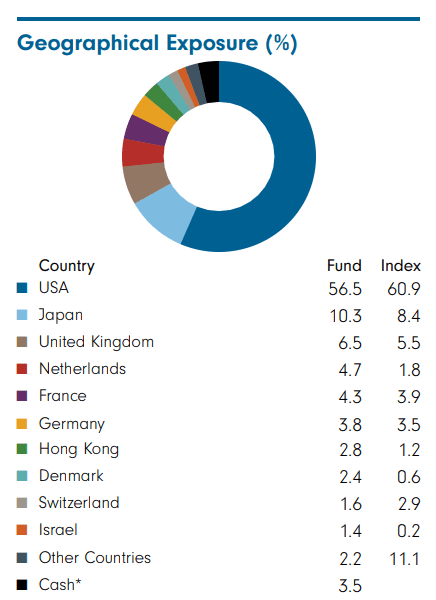 We usually form a global allocation for our portfolio. This is determined by how long do we need the money. Think of this as a long term savings. Your normal saving accounts earns a consistent interest a year. This portfolio of unit trust will make money, but in the middle, sometimes it swings negative sometimes wildly positive. Your job is to add money consistently to it. If we have a longer horizon, our money can withstand some higher volatility. This means that we can have more equity based unit trust, compared to bond unit trust. So for a young person you can have a 70% equity unit trust, 30% bond unit trust, or 80%/20%. Over time, as you get closer to when you need the money, you tuned down the equity portion so that your bonds portion is larger. 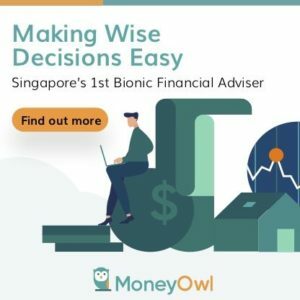 Doing this will reduce the portfolio volatility, to ensure that when you really need the money at that absolute amount, the money is likely there. Typically for most people, I would recommend a Global Equity Unit Trust and a Global Bond Unit Trust. This becomes simple when you need to re-balance and all. The following is taken from a Fidelity Global Unit Trust. By purchasing a global unit trust, you usually get exposure to a set of developed countries. An index will constitute each country based on the companies in the countries according to market cap. In a unit trust, the manage can choose to tilt the allocation, or the companies that they invest to where they think gives higher return. But largely they should not veered far off. For those who wishes to be speculative, they can choose to create a satellite allocation, out of their main allocation. So what this means is that suppose you have $100,000. If you are not speculative and wishes to keep it simple, your allocation could be $70,000 in a global equity unit trust, and a $30,000 in a global bond unit trust. If you are you could carve out a % of your equity allocation to form a satellite allocation. For example this could be 20% of the equity allocation, or $15,000. If you think China and India are good best, you could allocate $7,000 in a China unit trust, $8,000 in an India one. In this way, you can still keep within the portfolio volatility you can accept, yet be speculative about it. If you set it up like my friend, you live and die by China and India. So you better jolly well be very in tuned with the macroeconomic situation in China and India. You know what is surprising? 14 years ago when I started investing in unit trust, I hear investors buying China and India in their Investment Linked Policies. Today, we are still seeing them! Very popular choices! I think one misconception when people invest in a unit trust is that the manager can do a lot of things that will make your unit trust perform like a rabbit. You see there is a career risk if the manager decide to be gung-ho, develop a mind and pick stocks within its mandate that veers far from the benchmark index. If their picks do badly, they lose their job. If the picks do well, people will praised them and more money will flow into the unit trust. However, it has been shown that it is pretty difficult to beat the index. So there is a risk if you venture into an allocation that is far from the index. Bill Miller of the famous Legg Mason fund said in a podcast many active managed fund manager are closet indexers, This means that their allocation for large part, mirrors that of the index. And who would like to lose their job? If you don’t do too well in a fund, you might develop a reputation in a tightly knit industry. Also, while you may have a slant over which stocks you are bullish upon or you could be very bearish, but the fund may be constrained in that they cannot buy more than X% of their fund in a particular stock. This limits the gains (and of course the losses) if the manager is very good. There is also a risk if you are bearish, yet if you keep more cash, you underperform the index in the short run. As an individual stock picker like myself, I don’t have to worry about that. My objectives are different in that it is to grow money asymmetrically at lower risk so that I have enough wealth to be secure. When I am near the end goal, I do not have to beat others. The goal is reached, and strategically, you adjust accordingly. As a fund manager, the situation is different. Your job is to ensure the fund performs well, to earn good risk adjusted returns in and out. I have a lot of respect for fund managers after trying active management myself. I have some advantage that they do not have. Of course they have a lot of advantages that I do not have as well! Do we see closet indexers here? In the China and India space, they don’t show a lot of evidence of that. You don’t get a 7-13% 10 year return versus 4% for the index without having some original ideas there. Now this is the part where I am a bit befuddled. Not sure if my friend is invested in a investment linked policy or a unit trust in a managed account. My friend say he has already paid for the sales charges and if the manager is not switching so should he not pay for the wrap fee. Now I think… you should either have one or the other. A wrap fee, if I get correctly is like an AUM fee. 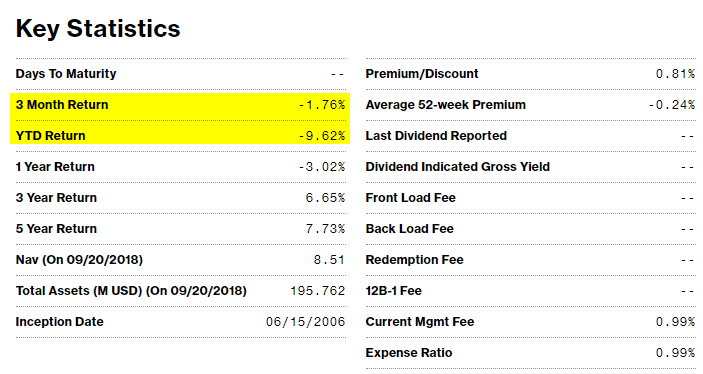 So like Stashaway which is a ETF Managed account, they charge a recurring AUM fee of 0.8% if your investment is the lowest. That AUM fee is already high enough. If you have that, you shouldn’t charge people with a sales charge. If you charge a sales charge, you shouldn’t charge a AUM fee. So if you have both, the question is why are you still invested in something like this??? Unit Trust has a really bad name. But I am still aware there are investors still invest in them. I would rather put out something that help people if I can rather than spew the standard, they are bad and you should get out of them. If you have a good strategic allocation that is set up towards your time duration, and you add on to it, you can still turned out to be a winner. No reason for anybody to pay sales charge, switching fees, wrap fees for UTs. You’re already stuck with the 1.6%-2% annual expense ratio. Anything much more than 2% is too expensive. Becoz of the zero switching costs & sales charge, you can implement a quantitative dual momentum strategy using UTs e.g. using 3 UTs based on US equities, S’pore equities, and a money market fund. You can replace the S’pore equity fund with an EM or Asian fund. You can use portfolio visualizer website to test out the strategy & determine the parameters (I find 6-12 months look-back is optimal). Ironic for Bill Miller to say what he said, coz he is a prime example of someone who beat the index for many years (15 consecutive years in his case) and then underperformed for quite a few years losing tons of customers& finally his job. Another good example is Bill Gross the former bond king.